I have had a major love-hate relationship with cake since we moved back to the Denver area. I love it, of course, because I love to eat it. I hate it because most sea-level cake recipes produce cupcakes that either (a) have sunken-in tops or (b) practically explode all over the muffin tin. I’ve had some moderate success with the “standard” high-altitude recipe adjustments (oh, if only there truly were standard adjustments), but most of my attempts have resulted in failure. Recently, I inherited a high-altitude baking cookbook – High Altitude Baking (original title, eh?) by Patricia Kendall – from my friend Hilary. I knew from my experience with Pie in the Sky by Susan Purdy that recipes don’t necessarily work well at altitude just because they’re published under that claim… While I had great success with her Independence Pass Brownies, the 1-2-3-4 Cake was dry, dense, and practically inedible. I wanted to make cupcakes for the Super Bowl, though, so it was time to take a chance on a new recipe. 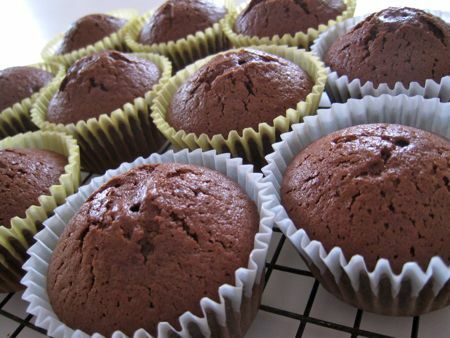 I chose Chocolate Sour Cream Cupcakes as the first recipe I would attempt from High Altitude Baking, mostly because I had all the ingredients except an easy-to-purchase cup of sour cream. My first rumbling of trouble came when I realized that I had purchased light sour cream (habit!) instead of full-fat for the recipe. I forged ahead with the recipe anyway and ended up with predictably less-than-fantastic cupcakes: while they did have decent crowns, they were exceptionally airy and almost chewy from the lack of fat. Dr. O had put in a request for a few more Super Bowl snacks and we needed to head back to the store, so I decided I’d pick up some full-fat sour cream and try the recipe again. This time, I ended up with delicious but ugly results; the cake was far more moist, but the batter had overflowed (even with the cups only half full!) and the tops of the cupcakes were crusty and misshapen. (Sigh.) Even with lots of icing, there was no covering that up. Thankfully, I had also replenished my supply of baking cocoa while we were at the grocery store, which meant I had everything I needed to try one more recipe from the book: Chocolate Cupcakes. After my two sour cream cake failures, I had higher hopes for this recipe because it had a traditional ingredient: oil. (The only fat in the sour cream recipe came from two squares of chocolate and the sour cream itself.) I followed the hand mixer instructions (see below), baked them for 23 minutes (instead of 25) and guess what? I had beautiful, moist little cupcakes – with crowns! I frosted them with my favorite icing (see below), topped them with sprinkles, and added them to the Super Bowl spread. Mmmmm. I think I might have preferred chocolate icing with these cupcakes, so I’ll try that next time. I was just so freakin’ excited about finding a high-altitude cupcake recipe that worked, though, that I would have happily eaten them without icing. 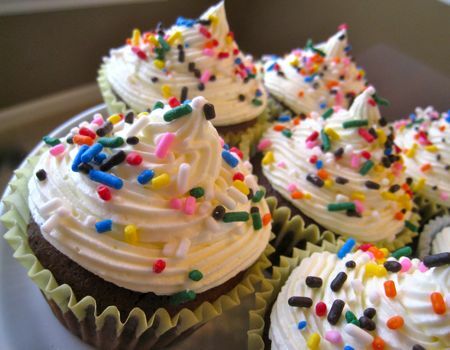 I’m looking forward to making these again and again… Cupcakes, minus the frustration! Preheat oven to 375F. Grease and flour two 9-inch cake pans, one 9 x 13-inch baking pan or muffin cups. Mix and sift flour, cocoa, sugar, and baking powder together into a bowl. Add oil, vanilla, eggs, and milk; beat for 30 seconds with a mixer at low speed, scraping the bowl frequently. Beat for 7 1/2 minutes more with a stand mixer at medium speed or 6 minutes with a hand mixer at high speed, scraping the bowl 4 – 5 times. Pour batter into pans. Bake for time recommended below, or until a toothpick inserted in center comes out clean. * Remove cakes from oven and cool in pans for about 12 minutes. Remove cakes from pans and finish cooling on a wire rack. *Two 9-inch cakes: About 28 minutes. One 9 x 13-inch cake: Lower oven temperature to 350F. Bake for 30 – 35 minutes. 24 cupcakes (1/2-full): About 25 minutes. 6,500 – 8,500 feet: Decrease baking powder to 1 3/4 teaspoons. 8,500+ feet: Decrease baking powder to 1 1/2 teaspoons. Increase milk by 1 tablespoon. Add liquid of choice and beat until light and fluffy (approximately 5 to 8 minutes). Keep the bowl covered with a damp cloth or plastic wrap. Store the icing in an airtight container and freeze for up to 3 months. I’ve had a lot more luck with cakes that are dense (flourless, cheesecake, etc.) or egg white-based: Almond Torte, Chocolate Valentino, and Chocolate-Pistachio Torte (my favorite and it’s so elegant!) are recipes that have worked for me. Whoopie Pies are also cake-like and didn’t give me any trouble. Independence Pass Brownies aren’t cake but they are ridiculously delicious; you should have them in your recipe arsenal if you live here. If you look at desserts in the “I want to cook” tab on the right-side bar of my Web site, any recipes made starting in October 2008 were made here in Denver. Since I haven’t been back in town all that long, I’m still trying to adapt my favorites to work at altitude. If there’s a particular recipe you want to try and you’d like a partner to compare results, let me know! I haven’t fired up my “request line” in a while, and I’d love to help. Success! They domed so nicely. I think I would double the recipe, because these seem a bit puny and I only got 21 out of the batch. delicious though!! I am new to your blog! Came across it looking for a redemption of many days baking frustrating flat, sunken chocolate cupcakes! I live in Salt Lake City and we are approximately almost at 5,000 Feet. I am a transplant from the southern east and it has been frustrating seeing my family recipes flop, after flop…especially with cupcakes and chocolate recipes. I had ran across the High Altitute Baking link and not purchased the book being a bit skeptical only because I have almost given up in baking. Like you I have made adjustments here and there with adding liquids, decreasing baking soda and adjusting flours – along with a “Hail Mary” when my batters go in oven. I have a request to make chocolate cupcakes for a girlfriend’s daughter tomorrow and I cringed as I had wished she would have prefered a different flavor! In reading your recipe, and quick view from the link, it does not mention if this recipe calls for the proper adjustment needed based on the altitude you live in? When you made your batch did you bake them as noted in the book? Or did you make the adjustments for your altitude? I want to definitely give it a try but confused if I have to make the adjustments or if it’s set for altitudes less than 6,500 feet? Thanks!! Hi, Annie! Thanks for your visit. 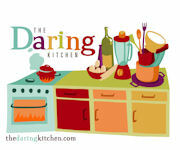 I can COMPLETELY relate to your high-altitude baking frustrations… Every recipe is a new challenge, isn’t it? Can you make this recipe into a 9×13 pan size? I’ve now made 3 chocolate cakes in the last 48 hours and ALL have fallen terribly. I’m at 4300′ so I didn’t anticipate such a problem. Hi, Barbara! The recipe says that for a 9 x 13-inch cake, you should lower the oven temperature to 350°F and bake it for 30 – 35 minutes. I haven’t tried it as a 9 x 13-inch cake myself so I can’t guarantee it, but I have a feeling you’ll be fine. If you try it, please let me know how it goes! Just made your chocolate cake…after reading all the directions I saw that I could use regular cake pans. I used 8″ pans due to the amount of the batter. The cake DID dome up and DID NOT fall, however, I’ve got this terrific dome and very low sides! Next time I’ll use the 9×13 pan size and see what happens. Maybe I should lower the temp?? But hey, at least this one didn’t fall — 1 our of 4 is the record now! Tomorrow morning I will try this recipe and I beg for it to work with some adjustments. I’ve been searchin the Internet for high altitude recipes or just regular chocolate cupcake recipes and tips to conver them for the altitude of my city (8000 feet, in Peru!) but nothing’s worked so far. I had trouble with vanilla cupcakes but finally found a great recipe at Joy of Baking but chocolate succes was elusive for me. I tried this chocolate cupcake recipe today for my Spanish class fiesta tomorrow. I live in the Denver area, which is the mile high city at about 5200 feet. I was amazed at how nicely these cupcakes peaked. The chocolate flavor was good. They have a good texture and don’t break apart when you remove the paper wrapper. I was a little disappointed that they were baked too long at 20 minutes. I’m glad I decided to check them at 20 minutes. They would have been burned at 25 minutes. The tops are crisp. Next time I make them I’m going to bake mini cupcakes at 15 mins., regular sized cupcakes at 18 mins. I’m going to keep the temp at 375 as the recipe indicates. Perhaps my oven runs a bit hot, it’s the first time I’ve made cupcakes in this stove. Thanks for your report, Ann! I really appreciate you taking the time to share your experience. The more information we have, the better. I’m about 700 feet higher than you in Highlands Ranch, so maybe that accounted for the extra few minutes of baking time. I have an oven thermometer, too, so I know my oven was right at 375F. Hope they turn out perfectly for you next time! Just made these tonight in Boulder for a party tomorrow. Absolute success; they look gorgeous. This after multiple failures, and I had given up almost entirely on baking since moving here from the Midwest a decade ago. Thank you. I only baked mine 21 minutes and I dropped my oven temp back to 350F and they were just right at that timing/temp. Thanks for sharing your success story, Beth! I’m so glad they worked out for you. Wow! Thats all I can say. I have been relentlessly trying to see the ever coveted DOME in Salt Lake City, and alas!–you’ve given the recipe! The domes are BEAUTIFUL! I think I will cook them a little less as they had a burnt flavor after about 22minutes. I was wondering, is there an adaptation to this recipe for vanilla?? Have been looking for a great cupcake recipe that I can make in Colorado Springs… while these aren’t THE BEST tasting cupcakes, they look better than any I have made. THANKS! I might be coming a bit late to this party but I just wanted to add that at 8500ft. in Vail, I just threw these little gems together in about 10 min. flat and they came out fantastic! I made the adjustment for the highest altitude and filled each cup with 2T of batter. Mary, for a wee bit more flavor substitute brown sugar for white, double the vanilla and either add 1 tsp expresso powder or do as I did and use 1/2 c. brewed coffee and 1/2 c. buttermilk in place of the milk. They are beautiful AND delicious and light as air! I’m going to smother them in marshmallow icing and likely eat everyone myself …. and then ski it all off tomorrow;-> Thanks for the great recipe! FANTASTIC input, Valentine! Thanks so much for sharing. Ooops – forgot to mention that I heeded the warning and watched carefully and pulled these babies out after only 16 to 17 minutes. DeLIGHTful! I tried this but I used buttermilk, instead of milk & 3 medium eggs instead of 2 large. They are short and dense. However, I was just informed that Fort Collins is not 6K ft and I used the 6K ft recipe. Sigh. They taste good. Thanks for sharing, I’m in Denver and am excited to try this recipe! Thanks. I don’t bake and never know what I need to do here in the Denver area so I was glad to find this. I agree that these cook very well but i am having a hard time getting them to be chocolate-y enough. Any ideas on what I do to get a deeper chocolate flavor? Hi, Lynn! Thanks for stopping by. I agree that these cupcakes aren’t super chocolate-y… I think you could probably increase the cocoa powder by 1 or 2 tablespoons without seriously affecting the workability of the recipe. Alternatively, a change in the *type* of cocoa powder might make a difference; next time I make these, I’ll try substituting 2 tablespoons of the cocoa powder with Savory Spice Shop’s black onyx cocoa powder, which is pretty intense. Thanks. I actually put chocolate chips in them and they came out pretty well…but I am going to try a dark cocoa powder when I make them for the birthday celebration that I need them for! Thanks again. Did anyone else have a problem with the cupcakes not being very sweet? Oh my goodness! My cupcakes actually looked like cupcakes, were the right density, and tasted delicious. I have missed baking so much since I moved to Colorado! Thank you for sharing this great recipe! Looking forward to trying it. Anybody have any problems (changes?) using GF flour? oh WOW!!!! thank you so much! these are the BEST cupcakes I have made living here in Colorado (I’m in Broomfield at about 5400ft). They are just substantial enough without being too dense, and not so light that they break apart when you frost them (which happens to me with store-bought mixes). I frosted with chocolate ganache and they are delicious. thank you again. I’ll be making these over and over. These cupcakes peaked beautifully, but next time I make them I would decrease the sugar a little and increase the cocoa powder a little. Kim, thanks for the tip..I also like my cupcakes kinda sweet. You are right about the cupcakes in Mexico..I live in Queretaro so I know the feeling. That’s actually the reason I started baking. Let me know if you have any other good recipes for this area…and PS: have you found meringue powder where you live? Thank you so much for posting this recipe! I am 15 years old and have been trying various cupcake recipes but find that everyone of them sinks in the middle. I was so happy when these cupcakes came out the exact opposite of sunken in, puffed out! Thanks! Hi. Just made these for Mother’s Day. Topped with cream cheese frosting in pink and purple flower/rose frosting piping. I’m going to put sticks from the craft store into the bottom of 8 of them and put them into a flower pot in lieu of flowers. Thought the cupcake portion was going to be just a touch bland, but with the cream cheese frosting, I think it turned out beautifully. No crumbling, nice outer crust with soft moist inside. Just right. I was wondering how to make them sweeter. They are good cooked perfectly but need a little more sweetness. Thanks. Great recipe! Another great and cheap resource is “The High Plains Sifter: Retro-Modern Baking for Every Altitude. Over 300 recipes with a photo of each one. Our family moved to Bozeman 3 weeks ago at 4800 ft….everything I have baked thus far has been thrown in the trash, and I used to consider myself an avid baker prior to the elevation issue. My daughters birthday is in a couple days and I was desperate to find a muffin recipe that worked. My muffins came out perfect! Thanks so much! These recipe is only good for looks, definitely NOT for taste! My husband and I were so disappointed on how they taste even with my homemade caramel and my marshmallow icing.